Vega, also known as Alpha Lyrae is the fifth brightest star in the night sky, and is the brightest star of the constellation of Lyra. Vega is 25.3 light years away but still has an apparent magnitude of 0.03, allowing it be easily seen in all but the most light polluted skies. Because Vega is one of the brightest stars in the night sky, it is well known and often referred to in human history. The word Vega itself is from Wega, which itself is a loose derivative of the word wāqi, which means "falling", via the phrase النسر الواقع an-nasr al-wāqi‘ "the alighting vulture". This in turn is likely from ancient Egypt, where the constellation Lyra itself was seen as a vulture. The constellation was also a vulture or eagle in ancient India. For the Polynesians, the star was whetu o te tau, the year star. The Assyrians saw the star as Dayan-same, the "Judge of Heaven" while the Babylonians referred to the star as Dilgan, "the Messenger of Light". The Chinese placed Vega in the same mythology as Altair, and called it 織女 Zhi Nü. For ancient Greeks Vega was the handle for the harp of Orpheus, of which the entire Lyra constellation represented. The Roman empire used Vega as an indication of the start of autumn, which was the time Vega set below the horizon. In astronomy, Vega was the first star to ever be photographed, using a 15-inch refracting telescope at Harvard Observatory in July 16–17, 1850. 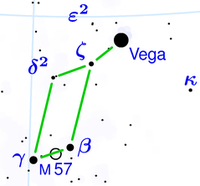 Vega is a main sequence star of spectral class A0 V, much like Sirius. Vega is 2.3 to 3.2 times as massive as our Sun, and some 2.73 times its diameter. Vega is considerably more luminous, being 37 times the Sun's luminosity at the equator and 58 times as much at the poles. Like all class A stars, most of the radiation from Vega is in the ultraviolet. Vega is only some 63 percent as enriched as the Sun, based on its abundance of iron. Vega rotates so fast that it only takes some 12.5 hours to complete one rotation, in comparison the Sun which takes 25.4 days to complete one rotation. This rotation is so fast that observations suggest that the star is rotating at some 91 percent of the angular velocity needed to cause the star to physically fly apart. Vega is thus 23 percent wider along its equator than at its poles, as well as some 2300K cooler. Here on Earth, Vega is seen as pole on (looking directly at its pole). Vega, like many young stars, is orbited by a disk of fine dust and ice, first discovered in 1998. In 2005, using the Spitzer Space Telescope, NASA astronomers observed that the disk was actually far larger than originally thought, and extends outwards from 70–102 AU to as much as 850 AU. Because the circumstellar disk of dust around Vega is partially gathered into larger clumps, some astronomers believe this is caused by the gravity of a giant planet in orbit. However, so far no substellar companions of Vega have been confirmed. In 2006, the CHARA array at Mt. Wilson observed a second inner disk of dust within 8 AU of the star. Vega's habitable zone, where liquid water could exist on the surface of an Earth-like world, is centered on 7.1 AU, a distance between the orbit of Jupiter and Saturn. ↑ Massey, Gerald (2001). Ancient Egypt: the Light of the World. Adamant Media Corporation. ISBN 140217442X. ↑ Wei, Liming; Yue, L.; Lang Tao, L. (2005). Chinese Festivals. Chinese Intercontinental Press. ISBN 750850836X. ↑ Allen, Richard Hinckley (1963). Star Names: Their Lore and Meaning. Courier Dover Publications. ISBN 0486210790. ↑ Barger, M. Susan; White, William B. (2000). The Daguerreotype: Nineteenth-Century Technology and Modern Science. JHU Press. ISBN 0801864585. This page was last modified on 10 January 2018, at 08:07.